South Korean electronics giant Samsung sells 100 million Galaxy S series smartphones since the first model in the series was released less than three years ago. Samsung launched Galaxy S series smartphones in May 2010. Galaxy S3 is the most popular high end smartphone and currently it sales more than 190,000 units per day. 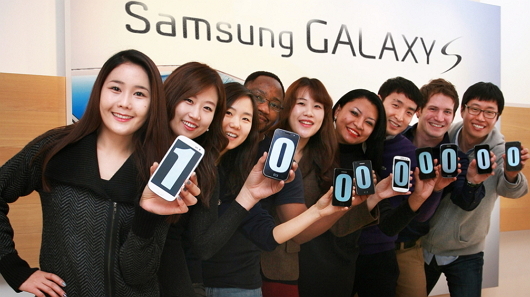 Samsung Electronics’ flagship Galaxy S series surpassed the accumulated sales record of 100 million units from the supply side in only 2 years and 7 months after its launch in May 2010. Galaxy S III is selling at much faster rate of 30 million in 5 months and 40 million in 7 months, after becoming a million seller in only 50 days after its release last May. Currently, its average daily sales are 190,000 units. The driving force behind Samsung Electronics’ rise to the top on the global smartphone market is Galaxy S II which is gaining ground as a steady seller hitting the sales of over 40 million in only 20 months.